I’ve always been a sucker for fairy tales, especially when they involve Death (as a character, I’m not that morbid). This week I’ll be reviewing the stunning western/mythic/fairy-tale amalgamation that is Pretty Deadly. So far there are only five issues which have been collected into a single trade paperback volume but the second arc is due to begin in September of this year. Kelly Sue DeConnick is the writer for this one and I have to say that while she hasn’t previously impressed me, this completely blew my mind. I haven’t had this feeling of seeing a new myth woven together in front of my eyes since reading the Sandman series. Above all else, its strange, mythic quality is what I find most impressive about Pretty Deadly. Pretty Deadly is the tale of a young girl named Sissy and her guardian, a mysterious blind man named Fox. The two travel from town to town in a magic realist version of the West, telling stories to earn coin enough to get by. Fox has a past haunting him and it quickly becomes clear that Fox’s history and Sissy’s present are hopelessly tangled up with some dangerous, otherworldly people. Fox and Sissy will have to rely on their friends to deal with the dark threat hunting them. I will admit right now that I doubt I fully understood segments of this story, particularly the intros to each issue which feature a bunny and a butterfly who are telling the main tale. Beneath the fairy tale layer, there are symbols and allusions being built and I’m almost positive I didn’t catch a number of them. Just like Sandman, it isn’t a book you only read once. And for all its magic realism, Pretty Deadly doesn’t hold back on the brutality. It’s a proper Western with numerous gunfights, explosions and even sword fights between distinctly nonhuman creatures. DeConnick is known for being an outspoken feminist and one of Pretty Deadly’s greatest triumphs is the multicultural cast of badass women that populate its pages. There are no damsels in distress here, not even Sissy, and I loved that no character became a stereotype. Sarah isn’t the strong, sassy black woman. She’s just a strong woman who’s protecting her family and friends. Her race doesn’t define her identity any more than the cultural identity defines the other women in the story. I particularly loved that it was feminist without being militant. The men in the story, particularly Fox, are human without being needlessly brutal or violent. Like the women, they’re just people trying to protect those they care about. The themes of violence and sacrifice run throughout and it’s gratifying to see how each character contributes to the journey of Fox and Sissy. For all the talented writing by DeConnick, what really pulls this story from good to downright magical is the artwork. 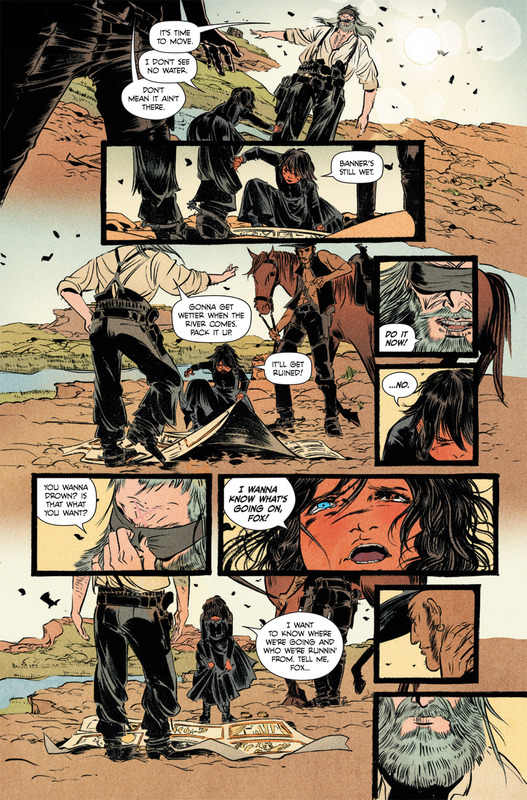 There’s a reason Pretty Deadly was nominated for multiple Eisner awards, including Best Penciller/Inker for Emma Rios and Best Colorist for Jordie Bellaire. It’s rare for me to comment on the artwork of a graphic novel unless it provokes strong feelings. Most of the time, I find the artwork to be good at showing the writer’s vision but not anything I’d hang on my wall. If I had the space, I’d hang every last panel of Pretty Deadly. 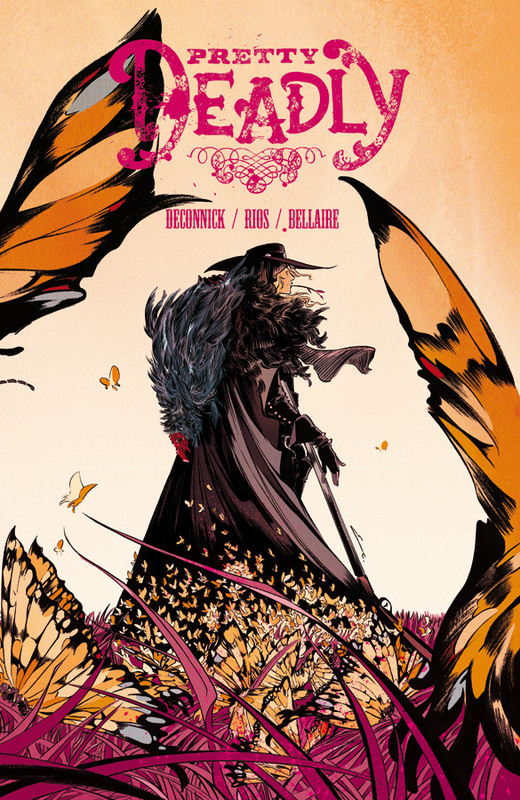 Rios and Bellaire perfectly illustrate the beautiful violence of Pretty Deadly in a way that left me marveling as much at the artwork as at the writing. When a comic impresses me this much, I find it’s hard to put into words how I feel about it. Something this magical is going to affect every reader differently. 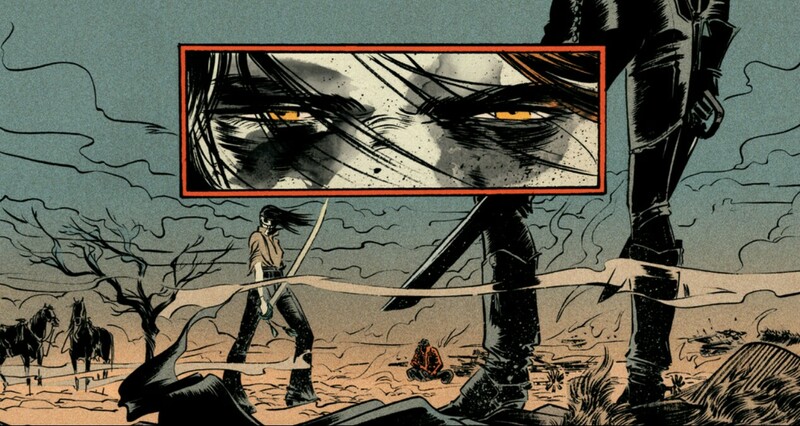 But above all, if you enjoy elements of Western, fantasy and horror and want to look at page after page of outright gorgeous artwork, Pretty Deadly is one you should not miss.